Much of the past century saw a winning-streak by the right wing NPA, Vancouver’s historic party of wealth and privilege. Pundits talk about Vision Vancouver’s interruption of that NPA legacy, and there has even been talk of the disintegration of the NPA “brand.” By winning two consecutive terms in municipal office, Vision is said to be taking Vancouver in a new, progressive direction. Both the voting record and the policy agenda of the last four years under Vision reveal that the perceived interruption of NPA rule is a patent illusion. The reality is that Vision’s core policy agenda has been a carry-over from previous NPA initiatives. Eco-density, the Tax Shift, the Chinatown Height Review, increased police budgets and heightened ticketing – for anyone who digs into recent history, these seemingly contemporary initiatives are relics of Sam Sullivan’s 2005-2008 term. Despite appearances, NPA’s platform is today found front and center, fashioned with a different, greener logo – and with the exception of those bike lanes. 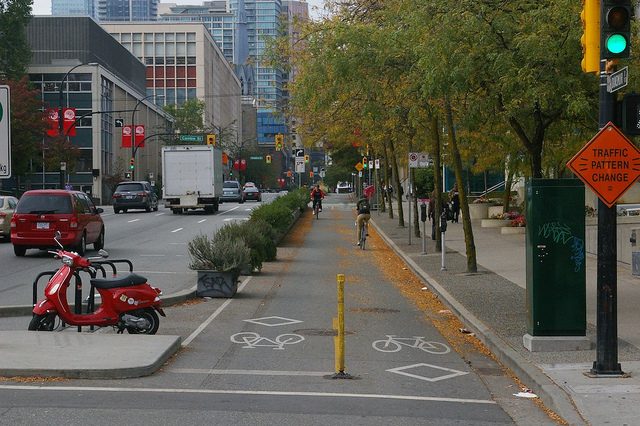 On all issues since 2008, Vision and the NPA have voted as a unified block minus the bike lanes. Eco-density in particular (an NPA initiative under Sullivan) has been slammed down the throats of neighborhoods since Vision’s election in 2008. Rather than forcing monopoly developers to use their empty parcels of land, Vision has used the key tools of NPA ‘revitalization’ policy – area rezoning, tax breaks and fee exemptions – to facilitate the gentrification of existing affordable neighborhoods. Poverty and homelessness are worse then ever, matched in their scale only by the profits of the developers and land owners. The housing crisis worsens while Vision continues cutting taxes and saying they don’t have any money for the things they got elected to deliver. The Tax Shift away from business was an NPA initiative that Vision has only carried to an extreme. The policy has helped bankrupt a City Hall that now has the lowest combined corporate taxes in the world. It is the poorest of the poor who have been forced to pay the most in Vancouver’s new culture of “green” capitalism. They are now thrown in jails daily by Vision’s money-rich VPD. In the lead-up to the Olympics, the NPA ramped up the VPD and clamped down on the urban poor by passing the Safe Streets Act. But yet in his 2008 campaign for office, Gregor Robertson ran a series of negative campaign ads attacking the NPA for not hiring extra police officers and for being soft on crime. Even though Vancouver had experienced a 9% decrease in the crime rate from 2007 to 2008, Gregor portrayed crime as “skyrocketing” and smeared his opponents for not fortifying law and order. Once elected, Vision followed through by hiring 100 extra police officers and clamping down on civil liberties. In 2008 the police were already absorbing $180m per year. Today, after four years of consecutive increases, total police expenditures are $213 million — more than 20% of the city’s budget. By taking millions in campaign finance from the biggest players in real-estate – as well as more minor financial players like the police union – Vision has struck a deal to consolidate the very system of inequality it had campaigned to eliminate. Posted in City Hall, Cycling, NPA, Police, Public Expression. Bookmark the permalink.